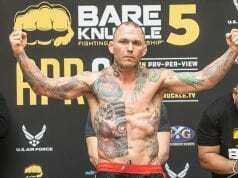 The Bare Knuckle Fighting Championship (BFKC) will host their most anticipated event tonight (April 6, 2019) in Biloxi, Mississippi when Artem Lobov meets Jason Knight in the BKFC 5 main event. As always, LowKick MMA will have you covered with all the results from BKFC 5. BKFC has partnered with FITE.tv to be the card’s PPV provider. The 5th event in the promotion’s history will be their biggest to date. With five former UFC fighters making the walk to the squared circle on Saturday night, BKFC 5 should deliver.